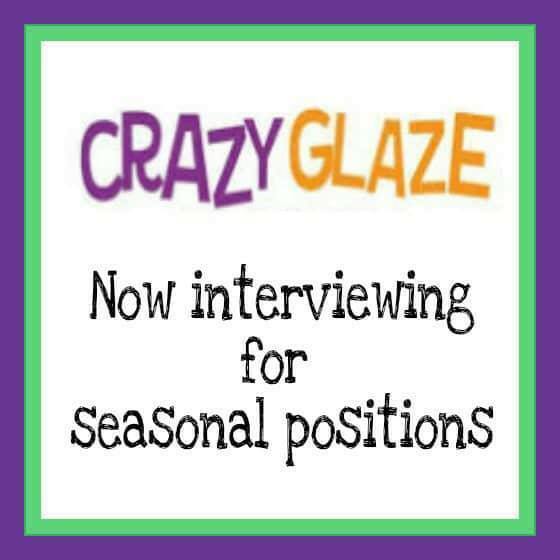 Crazy Glaze Is Now Hiring! We are always looking for great staff members to join our team. Are you friendly and artistic? Can you work with our customers and help them create something special and amazing? Do you go that extra mile to give excellent customer service? Do you go the extra mile to help the team? Would you like to work for us or do you know someone who would be perfect for Crazy Glaze? Our positions are seasonal. Experience is great, but not necessary. We will train the right person in the Crazy Glaze way! Our part time positions involve the learning of all products, processes and programs offered at Crazy Glaze. These include glazing finished product, loading/unloading kilns, keeping the studio clean and tidy, restocking and maintenance of all displays, running parties and assisting customers with all their needs. Our studios are busy places so be prepared to be busy! We have built our business reputation on giving great customer service so if you don't like helping people then this is not the job for you! • Enjoy working with adults and children. • Be self-motivated, good at multi-tasking, and able to handle a fast-paced environment with little supervision. • Have a warm, engaging, and positive personality. • Have an artistic interest or appreciation. • Always go above and beyond with customer service and teamwork. 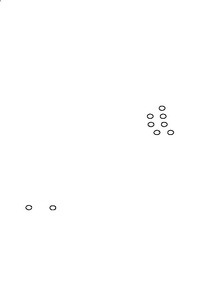 • Be able to clearly communicate with customers and coworkers. • Be able to work evenings and weekends.